Earlier this month, UEFA met with representatives of supporters' groups to continue the crucial dialogue between the governing body and fans, with the overall good health of football in mind. UEFA was represented at the meeting, which is held every year, by President Michel Platini, General Secretary Gianni Infantino, adviser to the UEFA President William Gaillard and members of the UEFA administration. Supporters' groups were represented by Football Supporters Europe (FSE), Supporters Direct (SD) Europe, and the Centre for Access to Football in Europe (CAFE) – all of whom receive specific UEFA backing and recognition. 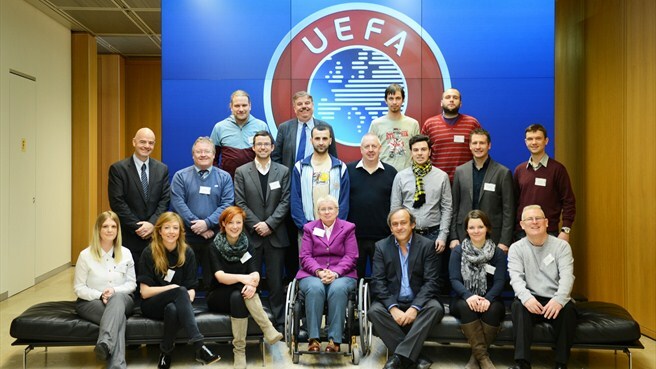 This was the sixth such meeting between UEFA and the fan groups. Supporters Association has been founded. CAFE’s Head of Development in Eastern Europe, Elena Karpukhina, and Project Coordinator in Ukraine, Olena Zhyvaikina, attended an event dedicated to the launch of the group. The club officially announced that 30 wheelchair users and 20 deaf or hard of hearing football supporters who were present at this event became the first members of this fan-club. 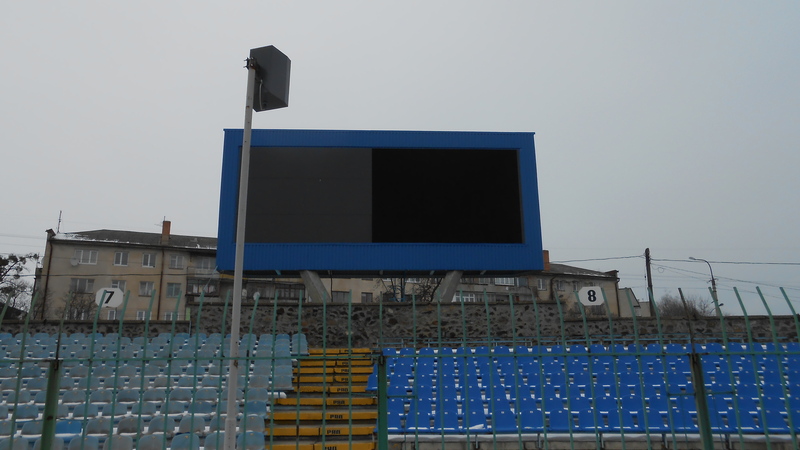 The club is also planning to invite blind and partially sighted supporters to join the DSA when a dedicated audio described commentary system is implemented at the stadium in the very near future. To read more about this story, please click here. You can also find information on how to set up a Disabled Supporters Association at your own club by clicking here. Helping to set up the Disabled Supporters Group wasn't the only visit that CAFE have made to Kharkiv recently. Elena and Olena travelled to meet representatives from the club earlier in the year, and returned shortly after to deliver a course of disability awareness training. 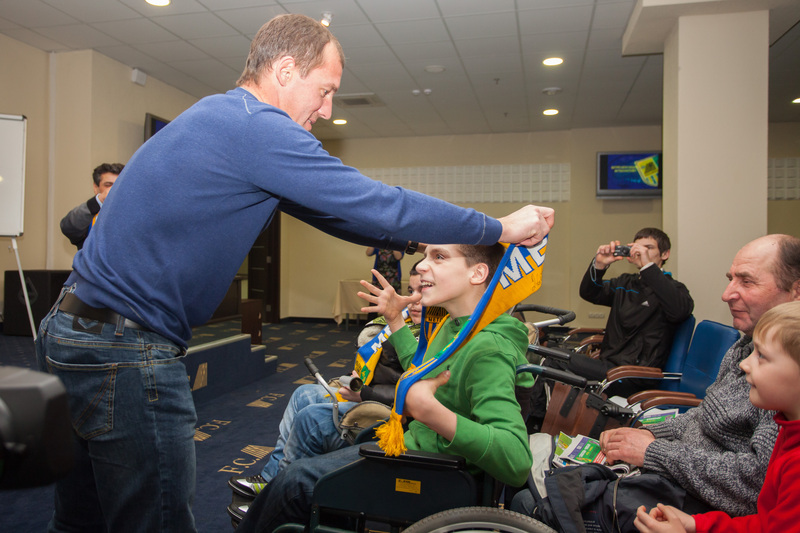 FC Metalist are now stepping up efforts to attract more fans to the stadium, and especially disabled fans. The club has a particular emphasis on getting more partially sighted and blind supporters coming to matches, and the club plans to implement an audio described commentary service in the near future. This is a service that was first made available during UEFA EURO 2012 as part of the disability awareness project that CAFE delivered around the tournament in all eight host cities across Poland and Ukraine. You can find more information about the first visit and the disability awareness training by clicking the desired link. Congratulations to FC Metalist Kharkiv and all involved! At the start of the month, Legia Warsaw launched an audio descriptive commentary service for their blind and partially sighted supporters. The service has been provided by the club, the Katarynka Foundation, Ekstraklasa SA and LIVE PARK. Audio descriptive commentary differs from a more traditional service, as it gives a much more detailed account of the action on the pitch and around the stadium. Where a TV commentary is based around statistical analysis, audio descriptive commentary is dedicated solely to the match and atmosphere. On 19th of February, CAFE’s Project Coordinator in Ukraine Olena Zhyvaikina met representatives of FC Volyn - SLO\DSO Yurij Kovaltchuk, press-secretary Yurij Konkevitch and general director Yevgenija Zhukhovitchka. The representatives of Volyn are ready to support the initiatives of CAFE’s legacy project. FC Volyn is open for cooperation and is interested in attracting more disabled fans to the stadium. For more information on the visit, please click here. All of the CAFE team were deeply saddened to hear of a tragic road accident involving supporters of Polish football club Lechia Gdansk. A coach of supporters were travelling back from a match in Gliwice when they were involved in a crash, which has left a number of supporters dead and many more in a serious condition in hospital. Everybody at CAFE would like to send their heartfelt condolences to the families and friends of the victims of this accident. More information on this can be found on the Lechia Gdansk web page at http://www.lechia.net/. The national disability commission in Malta, Kummissjoni Nazzjonali Persuni b'Diżabilità (KNPD), has filed a judicial protest against the Maltese Football Association for failing to provide adequate access to the country’s national stadium. Further information about this story can be found here. For more information and a link to 'Access for All' - the UEFA and CAFE Good Practice Guide to Creating an Accessible Stadium and Matchday Experience, please click here. Social justice journalist Phil Mac Giolla Bhain recently sat down with a spokesperson for the Celtic Disabled Supporters Association (CDSA) for a short interview about the group. The CDSA, founded in May 2011, has at present approximately 120 members and is continuing to grow. Recently, the CDSA issued a statement about the effects of pyrotechnics in football stadiums and the implications that they can have for supporters with respiratory issues and those who bring a ventilator to the stadium. For information on this and to read the interview, please click here. For more information about the Celtic Disabled Supporters Association, you can visit http://www.celticdsa.co.uk/. Priestmangoode have come up with a really innovative idea to make air travel much easier for disabled passengers. They have designed a chair that consists of two elements: a detachable wheelchair by which passengers can be transported onto and off of the plane, and a fixed-frame aisle seat on the aircraft into which the wheelchair is mated to create a regular airline seat. To see a video of the concept in action, please click here. We think this is a really good idea and it would make air travel a lot easier. For more information on the concept, please click here. Scottish club Heart of Midlothian have installed a seated rest area for their disabled supporters. The seats, added in celebration of lifelong Hearts fan and trade unionist John Ross who passed away in 2011, are situated at the back of the Gorgie Stand at the club’s Tynecastle Stadium. 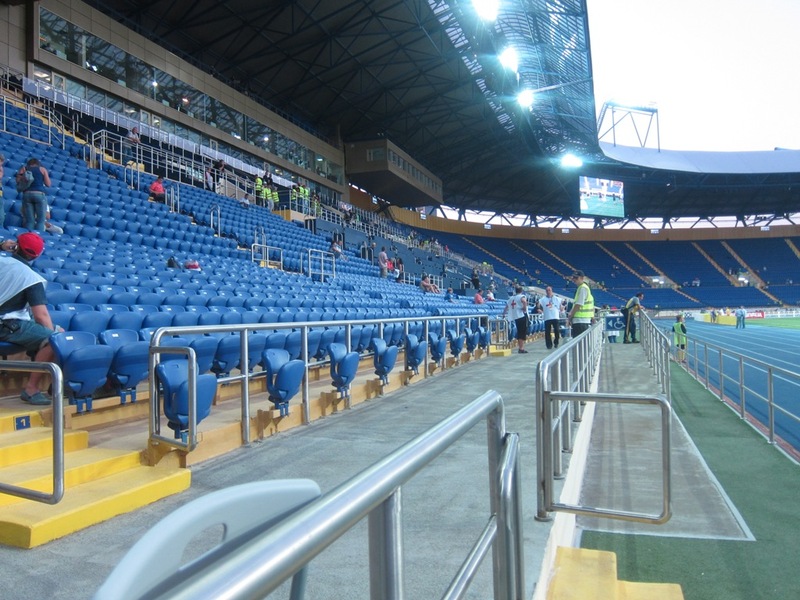 The seated rest area has proved to be very popular so far, and is a really good example of how to make small modifications to an existing stadium that can have a big impact. For more information, please click here. The recent Poland-Ukraine World Cup qualifying game in Warsaw provided an opportunity for both nations to celebrate the legacy of UEFA EURO 2012 through anti-racism and pro-diversity activities organised by the 'NEVER AGAIN' Association. Fans and journalists received Polish and Ukrainian-language leaflets with information about anti-racist activities run by 'NEVER AGAIN' and the FARE network. An anti-discrimination manifesto was read out on the stadium tannoy shortly before kick-off and a video reminding of the UEFA EURO 2012 'Respect Diversity' message was shown on the big screens. Could you be a CAFE roving reporter? Do you regularly attend football matches either as or with a disabled supporter? We are looking to add to our group of roving reporters, publishing your accounts of attending football matches across Europe. It isn't a huge commitment, and your reports could prove to be really helpful for other disabled supporters who will be attending those stadiums in the future. If you would like more information about becoming a CAFE roving reporter, please feel free to email us at info@cafefootball.eu. We also continue to ask for your stadium comments, which can be uploaded via the CAFE Stadia Reports website. Adding a comment is really easy to do, just select the country and club or stadium from the menus, and you can also attach any photographs that you have taken. If a stadium currently doesn't have a page set up, please email us at info@cafefootball.eu. At our September 2011 conference we launched the CLUB CAFE network. CLUB CAFE exists to bring like-minded people together to work towards our goal of Total Football, Total Access. Since the conference, the network has expanded considerably. People from all across Europe have added their voice to our cause. The more people speak up, the more our voices are heard. If you are unable to view this email correctly please click on /app/e/v/0-37952-0.aspx. CAFE | Regus House | Chester Business Park, Chester | CH4 9QR | U.K.